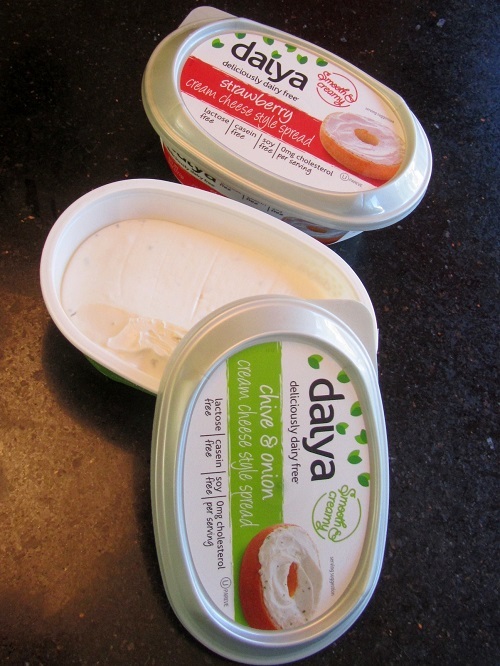 I was recently offered the chance to test some products by Daiya. I’d already tried Daiya dairy-free cheese slices and I’d heard about their new spreads, so I eagerly signed up for the job. Daiya is vegan, so it’s naturally lactose- and casein-free. Unlike some vegan spreads, it’s also soy-free, so if you have a soy allergy, don’t worry! I kept things simple for my first tasting: mini bagels and two types of spreads. I wanted to experience the flavor of the product. The chive and onion was amazing! 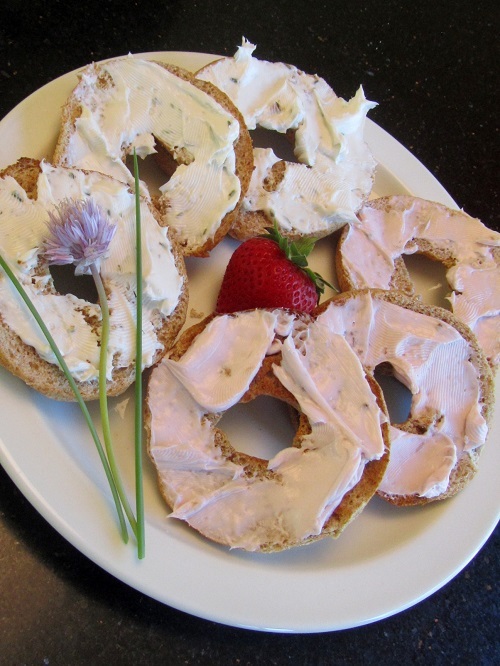 It’s a smooth, creamy spread and satisfied my bagel-and-cream-cheese craving. The strawberry was a real treat! I bet I could make a great cheesecake with it. The Daiya site has lots of recipes, so you can try new dishes. Daiya is named after the Sanskrit word Dayaa, which means “loving, kindness and compassion.” I love that Daiya Foods is founded on these values. Voting with my dollar is important and supporting ethical companies is something I’m always happy to do. The thought of giving up cheese is often what holds people back when they contemplate veganism. Well you don’t have to give up anything! You can have the cheesy comfort foods that you’re used to making and you can eat cruelty-free. You’ll also reap the health benefits of a plant-based diet when you ditch dairy. Look for other reviews. I’m going to try Daiya shreds either on a pizza on in a cheddar beer bread recipe. I’m also going to perfect a grilled cheese sandwich using their wedge. This entry was posted in cruelty-free, reviews, vegan cooking, vegan food, veganism and tagged cheese alternatives, dairy-free, Daiya, vegan, vegan cheese, vegan cooking, vegan cream cheese, veganism. Bookmark the permalink. I LOVE Daiya!! BETTER than dairy cream cheese. Thank you for introducing me to it! Now we buy Daiya pizza and Daiya cheesecake. ❤ I don't miss dairy.